Y’all! I promise I am not going to post about every run I do (mostly ’cause there probably won’t be that many) but let me tell you – I’ve been hoodwinked! Bamboozled! Led astray! Run amuck! Remember I signed up for C25K with the Y, yes? Okay. Last night was our first outing. In preparation I downloaded a C25K app so I could see what I was in for. The app outlined a 30 minute workout. 5 minutes of warm up, 20 minutes of run/walk, and 5 minutes of cool down. Um, yeah. Our group – there are 6 of us – met up at 6 to do the dang thang. We’re led by some perky chick who could give the Kenyans a run for their money – she runs those crazy long races. She’s also 7 weeks pregnant. Heifer. Anyway, where was I? Oh yes. We meet up and start with a 5 minute warm up walk. I’m feeling this. We then run. For 2 minutes! Ma’am. I just got off the couch. Shouldn’t we ease into this?!?!? What happened to the nice 90 second jog? And we did all three miles! I thought we’d start off with a nice 1 mile routine or something. Nope. We jogged/walked for an entire 3 miles. Took us 42 minutes. I wanted to cry. My thighs are waging their own protest by refusing to function in the manner to which I have become accustomed. By the time I regain feeling in my thighs it’ll be Thursday. And time to run again. Jesus, be some working quadriceps muscles. I was bored at work last Friday. Everyone was gone and whatever work I had to pretend to do had long been accomplished. So I decided to check out the offerings on Netflix. Scrolled over to the documentaries section and decided on two. One was “Still Bill” and is about a musical artist I’ve always loved – Bill Withers. If you get a chance, you should check it out. He is one cool, cool dude. Wait. Where was I? Oh yes, the other documentary was “Fat, Sick, and Nearly Dead.” Y’all! Basically it’s about two dudes who lose a tremendous amount of weight and clear up all sorts of chronic and acute health problems by adopting a “juice only” diet for a number of days. And now guess who’s going to do it? Oh yeah, that’s right. Your favorite blog-land nerd – moi! I don’t need – or want – to lose hundreds of pounds. About 10 will get me right. So what I’ve decided to do is one meal + unlimited juice for a week. After that I think I’m going to substitute the juice for one meal – probably breakfast. In addition to the weight loss, I’m hoping consuming the additional nutrients will help me with my eczema – it has gotten increasingly worse over the last two years or so and I’d really like to chunk the topical steroids in the garbage. I’m pretty sure they cannot be good for my health. After some hints and suggestions from One From Philly (thanks again! ), this is the juicer I’m going with – I’m just waiting for a 20% BB&B coupon to make its way to me. As soon as I get the juicer, it’s a go. I’ll let y’all know how it goes and if there are truly any benefits beyond the weight loss. Do you juice? What’s your favorite combo? If you don’t is it something you’d consider?? Am I supposed to put some sort of disclaimer on this entry? This is my blog, no one paid me to push this movie, I’m certainly not making any money from it, and if I pass out ’cause all I’ve consumed is some celery juice, I promise not to sue. How’d I do counselors?? How was your weekend? Did you party like a rock star? Chillax the days away? My weekends are never quite as chill as I plan them out to be in my mind. But that’s mostly because until now, I’ve pretty much refused to do that 15/20 minutes of housework a day that’s supposed to leave your weekends free. I think I’m going to try it – for real – this week and see if it works. Do you break your housework up or do you jump up on Saturday mornings and tackle it all? Saturday morning we hung around and cleaned up the house. Lovegirl was not pleased with the amount of time and effort she had to put into cleaning up her rooms. Yeah, that’s right, rooms. In addition to her bedroom she’s taken over the guest room and between the two rooms – sister had a lot of work to do. I’m hoping that this 20 minutes of dedicated housekeeping nightly will help her out too. Anyway, then we ran errands – picked up a few more fall/winter items for her – including a pair of suede boots for that were unexpectedly on sale for $20! Thank you Lord 🙂 We also picked up birthday presents for the next two weekends. I’m telling you – this kid has quite a social calendar! Saturday night we moved our maxing and relaxing over to Pserendipity’s house. Where Tim and Smoochy got to talking. About our blogs. Now, Smoochy’s always known that I had a blog, but he’s never bothered to read it. Tim? Reads Pserendipity’s blog. For real. After much discussion about their aliases, they’ve decided they no longer want to be called “Tim” and “Smoochy.” Um, Tim, your name is Tim. Nevertheless, they’ve given themselves new blog identities. You ready? You’re not ready. Tim would like to be called….Thug Thizzle. And Smoochy? Well, he wants to be called…Big Thug Thizzle. So….please know that from here out, Smoochy shall be called BTT. Tim Thug Thizzle also spent a good deal of time talking about how badly he and P whipped BTT and I last time we played spades. Except they totally lost. Every game. I think he really thought they won! Poor TT!! Sunday was spent playing hooky from church (it was our church anniversary and…I really don’t like programs) and taking Lovegirl to a birthday party at a local park. Initially I totally was not feeling the birthday party, but I must say, it was really nice and I had the opportunity to get in a few laps around the park. So, all in all we had a great weekend! 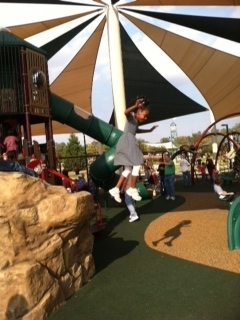 Lovegirl (who hasn’t requested a new name…yet) insisted that I get a picture of her in action yesterday. Here, in all her glory, she is! Man, I love this kid!! 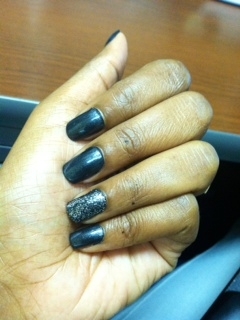 This week’s manicure: Coalest Day of the Year by Barielle. 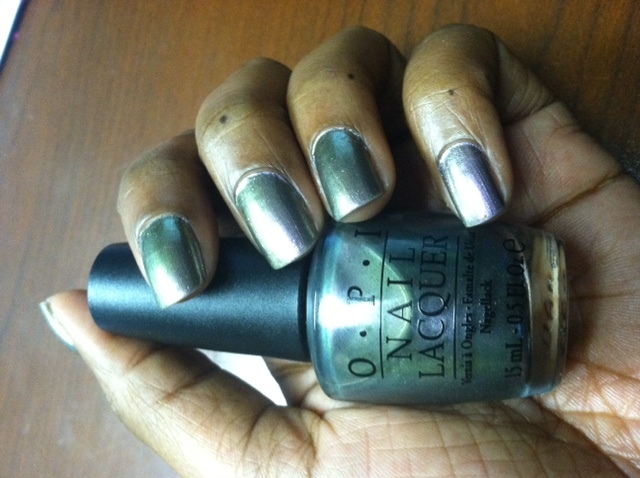 My ring finger bling is courtesy of Sinful Colors. One of my favorite cool weather colors! Brrrrrr…..it’s cold out here. Even though I feel like an old person when I discuss the weather, I’m going to do it anyway. It is downright chill-ay! I think it was 58 when I got up this morning and today’s high is only supposed to be in the low 70’s. Fall? Yes, please! Tropical Storm Lee hit with a slow, slow vengeance. It rained for 3 days. I slept for 3 days. ‘Twas marvelous! Except for all of the flooding that occurred – we weren’t affected, but I know that others weren’t so fortunate. You know who has no sense of urgency? An almost 7 year old kid. My child is slow as molasses in February. S-L-O-W! My hair looks ridiculous. I guess I should’ve expected to look like S.hirley T.emple since I spent 2 days with pipe cleaner curlers in my head. Did anybody watch the game last night (Miami v. Maryland)? Maryland truly has some of the ugliest uniforms I’ve seen in a long time. On the other hand, I love the Oregon’s uniforms – hot! Who’s watching RHOBH this season? I wasn’t going to, but tuned in last night anyway. Well, I’d pretty much made up my mind to skip the madness, but then I saw the previews for the rest of the season. I’m in! I made shepherd’s pie Sunday from a recipe I got at Jameil’s spot. Smoochy loved it. Lovegirl liked it. Until she realized those were mashed potatoes on top. She “doesn’t do” mashed potatoes. I still haven’t had it, but it looks/smells good. I’ll try it tonight. Have a great day!! Peace and blessings all around! Have you heard about James Anderson? The black man who was beaten and then run over and killed by a group of white teens here in Jackson, MS? Several of the teens’ supporters are crying “reverse racism” since the prosecutor has announced plans to pursue hate crime charges. Reverse racism. Really? There was a rally in honor of Mr. Anderson last weekend. Another one is planned for next week. My boss – a white man – asked me if it were okay if he went to the rally or if he’d be seen as an interloper. I assured him it was fine for him to attend. Had a great exchange on race on the Twitter last night. We are in no way living in a “post racial” America. I need a pair of black pants and maybe a pair of trouser jeans and I’m pretty much done shopping for the fall/winter. Speaking of pants and jeans, GAP is offering 30% of your purchase this evening between 3-7. Calvin Klein dresses fit me really well. I’ve been stalking the local TJ Maxx stores waiting for the “new” fall dresses – found one in putty, going to the other store in hopes of copping a purple one. Lovegirl wholly approves of my new purchases – particularly the dress. She said “Mama, you look like a woman. Fantastic!” Thanks. I think. I also ordered two pairs of shoes. You would not believe how hard it is to find a pair of basic black pumps in a size 12 for less than a gazillion dollars. Thank you Nine West clearance sale! Now let’s hope they fit. Did I tell y’all that Sinful Colors are on sale for 99 centavos at W.algreens? Well, they are. I limited myself to 5 bottles, but I think I’m going back today – I’ve been wanting to try a yellow and I figure at this price point I’ve got nothing to lose. I really enjoyed the book discussion on Monday. What y’all want to read next?? Let me know – I guess we’ll discuss in early September? Okay, that’s it. I hope everyone has a great day! I lied – one more thing. I tried the rowing machine at the gym on Tuesday. OMG! Who knew? I got a serious workout that I’m still feeling today. Love it! Posted in Book Club, Books, Fitness, Life In General, What U Got On? Well, well, well. Where to begin? I almost gave up on this book. Several times. It started off soooo slow. I had a very hard time getting into it and honestly, if it had not been for Jameil’s encouraging me to continue, I’d of put it down and walked away. But boy am I glad I hung in until the end. Loved it! After digging around a bit on the internets I learned that My Soul to Keep is the first book of a trilogy by Ms. Due – I definitely plan to finish the trilogy as well as read Ms. Due’s other books. I love discovering “new” authors and am glad to have found Tananarive Due’s talents. And while I realize this is particularly trifling of me, I don’t really feel like doing a review/synopsis of the book this early in the morning, so just head over to the comments and let me know what you thought of it. Okay? Okay! So…what’d you think about the book? Who was your favorite character? Why? Did you think about immortality as you read? Do you think you’d want to live forever? Why? Why not? Did you “like” David/Dawit? What about Jessica? I’ll try to answer these questions in my responses to your postings.